Review date: 16 June 2000. What would you expect to pay for a full-featured general purpose home and/or office laser printer? No, wait, don't answer yet. How would you like USB connectivity as well as the old-fashioned parallel port? PCLXL and 5e compatibility? Ten page per minute print speed? What about a free set of rhodium-plated minestrone spoons? Well, if that's what you're after, tough. Samsung's ML-5200A does not come with any cutlery. But it's got all of the other features you're likely to want from a medium capacity personal or small workgroup laser printer, and it costs only $AU699. The most popular laser printer around this price point's probably Hewlett-Packard's LaserJet 1100. It's a similar unit to the Samsung in many respects but, I think, loses out in the final analysis. The 5200A's 345 by 364 by 224mm (13.5 by 14.3 by 8.8 inches) in size, before you pull up the rear paper rest and attach the see-through front one; the H-P has about the same footprint. And both printers are 600dpi units, as pretty much all new lasers are these days. Older low-cost lasers are commonly only 300dpi. The higher resolution makes a small, but significant, difference to print quality. The Samsung has a higher raw engine speed - ten pages per minute, versus eight for the H-P. This isn't how fast you'll print complex documents - page setup and data transfer take time, which is never taken into account in printer speed specs. But for plain text or lots of copies of one page, you'll see pretty much the full rated speed. The H-P sells for $AU790. The Samsung's list price is $AU799, but its street price is likely to be lower, and when I first wrote this review m'verygoodfriends at Aus PC Market were selling it for $AU699 (however, they no longer stock this printer). The price difference might not seem like a big deal, but the Samsung's got a few advantages besides price. 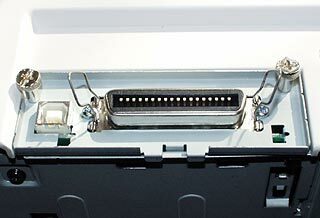 For a start, there's the 5200A's USB connection, on the back next to the standard 36-contact Centronics parallel port. The Samsung's driver CD only provides a Windows 98 USB driver, so you can't use the newer interface with Windows 2000, or recent Macintoshes, yet. But if you've got Win98 on a USB-equipped PC, you should use it. It's far more elegant than parallel. The cable's much less cumbersome, you can plug and unplug USB devices while the machine's on, and data transfers won't slow your computer down. Samsung don't deign to include a USB cable with the 5200A - all you get is parallel. But all you need is a plain USB A-to-B cable, which will only cost you another $AU7 or so. The 5200A comes with 4Mb of on-board memory, which is likely to be plenty for most users. The H-P 1100 has only 2Mb, which means it's going to use the computer to which it's connected to do more of the work on complex documents. This will slow that computer down a bit, and slow down big print operations quite a bit more. Undo the two screws that hold the Samsung's connector panel in place and you can slide out the memory expansion board, which has a standard 72 pin SIMM (Single In-line Memory Module) slot for up to 32Mb of extra RAM. 72 pin SIMMs are the RAM used by older computers, before the current SDRAM DIMM (Dual In-Line Memory Module) standard. SIMMs are still available, but expensive per megabyte compared with newer RAM. H-P's 1100 uses special 100 pin DIMMs. Traditionally, special printer memory is amusingly expensive, like laptop RAM, and it can be a significant hidden cost for serious workgroup printers that need a lot of it. Fortunately, the 1100's RAM modules are available from a couple of manufacturers besides H-P. If you shop around, the price difference between RAM for the Samsung and the H-P isn't likely to be large, unless you for some reason choose to buy H-P branded RAM modules. They're about twice the price of perfectly OK third party memory. The Samsung has 35 of H-P's scalable Intellifonts built in, 10 TrueType and one plain bitmap. The H-P 1100's only got 26 built in fonts. You can print any font you like, of course, but fonts the printer doesn't have built in will need to be downloaded at print time. This slows the print job down, and can slow it down quite a lot if the total size of the data for a page works out at more than the printer's on-board memory. According to Samsung, you'll get 6000 pages out of a $AU190 (list price $AU199...) toner cartridge for the ML5200A. That's using the "5% coverage" standard, with only one-twentieth of the page black. This rather pleasing cost per page is pretty much on par for a laser printer. After the dot matrix, laser printing holds the crown for cost per page, and beats the heck out of inkjet. A black cartridge for a budget sub-$300 inkjet will set you back about $AU50, but it'll be good for fewer than 250 5% coverage pages. With consumables costs like these, anybody who does a fair bit of inkjet printing will rapidly see the purchase price of the printer fade into the background. Four cents a page for laser, 20 cents a page for inkjet. A toner cartridge for the H-P 1100 will set you back less than $AU110, but it's only good for 2500 pages, so the per-page cost's much the same. The only extra gizmo you can plug into the 5200A is a RAM module. But the LaserJet 1100 has an optional clip-on sheet-fed greyscale scanner attachment that boosts the printer's price to $AU945, but turns your 1100 into a scanner/copier as well. The 1100 with the scanner bundled in is called the "1100A". I'm less than totally thrilled with sheet-fed scanners in general. They're great if you're short of space, but you can't scan anything much thicker than a standard sheet of paper, and for the same money you can get a basic stand-alone flatbed scanner. Which does colour. Still, the one-button operation you get from a multi-function device like the H-P 1100-with-scanner is handy, and there's a market for teeny-weeny scanner/printers. If you want this sort of thing, then this is the sort of thing you will want. In use, there's nothing very remarkable about the Samsung. It's got a 150 sheet paper hopper, and a manual slot for things like envelopes. Paper can exit via a slot on the front of the printer; flick a switch next to the slot and your printouts go up into the front hopper, with room for 100 pages. The 5200A's rated for a 6000 page per month duty cycle, which is well above what most home and small office printers are called upon to deliver. The H-P 1100's rated for 7000 pages per month. These figures don't mean a great deal, really - you'll be going through a toner cartridge every ten days for the H-P if you print this many pages - but they do indicate that both of these printers are made to do proper office work. Really cheap lasers may or may not last long if you use them in an office, but both of these printers should be fine. The ML-5200A's got ticks in all the right boxes, and a few more features than you'd expect for the money. It's hard to get excited about a printer, but if you're looking to buy a medium-duty laser with decent performance and a good price, this one's a good choice. Recommended. Basic laser printers have been very cheap for some years, now. About $AU350'll get you one. And, for home printing, these cheap printers are usually quite good value. Sure, a replacement drum-and-toner cartridge will probably cost you half the price of the printer itself, but that's nothing new for people who've looked at inkjet printer pricing. It has been observed that, these days, companies like Hewlett-Packard are primarily in the business of making ink. Low-cost laser printers are a good alternative to inkjet for home and small office purposes where you don't need colour printing, but you do want a lower cost per page, and faster results as well. But basic lasers aren't really meant to deal with more than a few pages a day. A lot of them'll last surprisingly well under small office print loads. But they've usually got little-to-no built in memory and processing power, so they depend heavily on the computer they're connected to. That results in slow printing of complex documents. And if you're consistently pumping one or two thousand pages per month through a dirt cheap laser, you shouldn't be surprised if it breaks down in the middle of something important, or if you find yourself changing expensive, low-capacity toner cartridges rather often. For not a lot more money, you can get considerably more performance. Mid-price printers may be overkill for home users, but anything less is false economy for a small office.